Geography 3.2: Understands human interaction with the environment. Objective: Students discover how Native Americans used plants in the Issaquah area to meet their basic needs, and compare that with how these basic needs are met today. Note to Teacher: Students should be reminded that they should never try eating or using a plant for medicinal purposes unless they have an adult with them who knows for certain the plants are safe. Remind students that some plants are poisonous, and sometimes poisonous plants can look almost identical to edible plants. In addition, some plants are safe to eat or use only when prepared in a specific way. Native Americans met all of their basic needs with the natural materials around them; trees, plants, animals, etc. 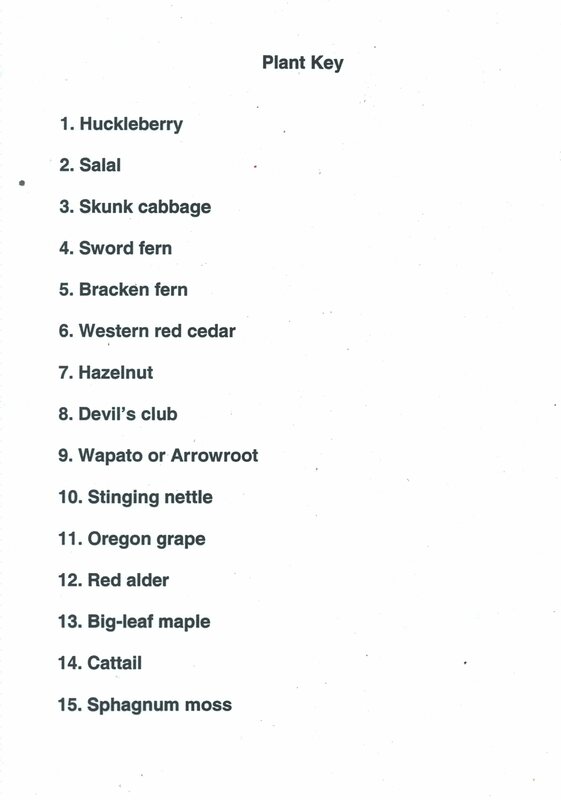 Explain to students that they will be examining plants and finding what the Native Americans used them for. Half of the class receives a laminated plant illustration. The other half of the class receives a plant identification card. This card gives a short description of the plant and a description of how the Native Americans used the plant. Students try to find their match. They need to read the description and study the plants to see if they have a match. Then, they can read how the Native Americans used the plant. Put the matching answer key up on the Power Point when students have had enough time to find a reasonable match. Some plants are similar in appearance. Some students may need the answer key to find their correct match. Once students have matched the plant illustration to the plant identification card, students can share with the group the name of their plant and the Native American uses. Discuss how we meet the same basic needs today. For example, Native Americans used cedar to carve bowls and spoons. Today we buy plastic or metal utensils at the store. Students use the worksheets to draw a picture of their plant, copy the Native American uses from the card, and draw a picture of how we meet the same basic needs today. Based on time and student interest, teachers may want students to complete the one worksheet that has “their” plant along with two others, or any number of additional worksheets. There are a total of 15 plants (5 worksheets, 3 plants on each worksheet).